I’ve got a bit of a “thing” about the Nicolson family and devour anything I see by and about them, although I noted when reading this one that I haven’t read any of Harold’s novels and I am patchy on my Vita Sackville-West oeuvre, too. It’s of course akin to the Mitford and Bloomsbury “things” that one can have – a group of people, different generations, books about and by to acquire, old and new. Anyway, I sprung upon this at a random book sale back in June last year (spending my bus fare money once I’d got safely back home from parkrun! ), had been greatly looking forward to it, and was not disappointed. It’s the first volume of a proper, old-fashioned biography, by which I don’t mean stuffy and straight-laced, but beautifully written and edited and with a healthy liking and respect for and understanding of its subject. Of course, there’s a lot about Vita, too, and her love affairs and their effect on Harold, and the development of their special marriage arrangement. Bloomsbury comes into it, too, but also lots of other figures – Sitwells (another “thing” of mine) and Gertrude Bell, for example. It uses primary sources to good effect, quoting long passages from Vita and Harold’s extensive correspondence (when he was away on diplomatic duties, they would write at least once a day, receiving letters in batches), and writing in Harold’s voice to a large extent when using indirect quotation. This makes the book extremely intimate and very readable, more so than you would imagine from first opening the close-packed print of this 1980s paperback. The book is illustrated with Harold’s sketches, which are charming, but I would have liked some photographs, and feel that’s a real lack. It’s also quite detailed on his works of fiction and non-fiction, which, as I mentioned, I’m not terribly familiar with, but the insight into the writing process is still interesting. A very good index rounds off a satisfying book which takes us to the end of Harold’s diplomatic career, told in lively and interesting fashion even when it’s going into the depths of discussions on treaties and ententes. I am desperate to get my hands on Volume 2 now! Would you be shocked to find out that I’ve never actually read any Trollope up until now? I don’t know how that happened, to be honest. I think I had him associated with Thackeray, having read but disliked “Vanity Fair” in my 20s. I do tend to have an odd reading relationship with classic authors – take my progress with George Eliot, where I read “Middlemarch” over and over again but didn’t tackle any of her other books until I was given a copy of “Daniel Deronda” a year or so ago, and I’m now happily picking the others up when I see them to prolong the joy of discovering the rest of her books. Anyway, I hadn’t read any Trollope, and several bloggers who I know and follow and like and share interests with had been reading him, so I thought I’d go for it. Well, again, I wasn’t disappointed. I thoroughly enjoyed “The Warden” and, while it was slightly odd to get to the end of a reasonably substantial book and find that you’re only 5% through the set, reading on Kindle has been absolutely fine, and has given a contrast with paper book reading of concurrent choices. I feel that Trollope falls into the Hardy arena with his small community life and rural chorus, and the Eliot arena with the web of connections and ties in a community, although perhaps, in this novel, on a slightly smaller, more concentrated scale. He’s human and humane as a writer, with immense sympathy for even his most unlikeable characters. He’s also much funnier than I’d expected, with asides about whistling bishops and a hilarious rant about Dickens in a metacritical aside about an author who has started writing a novel about the situation he is writing about (he also zooms into the picture, taking us into people’s houses and mentioning his dealings with them, in a way that again echoes Eliot). Trollope seems to use the premise of the book – that the Warden of a set of almshouses is found by a young, thrusting and radical doctor to be profiting unfairly from the charitable estate’s increased wealth, that doctor being the beloved of his daughter, and the bishop in whose gift the position lies being the father-in-law of the Warden’s other daughter (his son and her husband is the Archdeacon) – as an excuse to gather a set of people into one place and examine human nature and relationships. The Bishop and the Warden are firm, sentimental old friends, both afraid of the Archdeacon, and the women in the piece, while not here at the forefront, are their own firm people and rounded and likeable – I’m told that Trollope is good at women, and I look forward to meeting more in the next books. So, a joy to read, and I’m going to have to eke these out a bit, or else I’ll be reading them all in one gulp – I do want to enjoy them properly so don’t want to race through them. How marvellous to find a new author to love and know that there are books and books and BOOKS of theirs to read! When did that last happen to you? I’m currently reading another book from that batch of buys, Iain Sinclair’s “Edge of the Orison”, psychogeography in the footsteps of Essex poet John Clare and, because you can never be sure of what Sinclair’s going to come up with next, a rather silly novel set in Delhi which I’m not sure I’ll finish. Back in the dim and distant etc., when I lived and worked in London, lost in the mists of my first stint working for a library supplier, I would travel up from Moorgate to New Barnet with my colleague Paul. He was (and is) a lovely chap, maybe a touch eccentric around the edges, and on those train journeys, he would often be scribbling what I believe they call ‘rhymes’ (do they? I don’t know, I’m not in the least hip, let alone hip hop) on an A4 lined pad, sometimes practising them, too. He did ever such a good rap, composed on the spot, on my (first) leaving day and we kept in vague touch. Several (many) years later, and Paul Alborough, the jolly chap on the train, had metamorphosed into Professor Elemental, beloved and well-known exponent of the ‘Chap Hop’ genre of music. He’d moved from office work to teaching and then on to a full-time music career, and in fact I have been interviewing him in the Saturday Business Chat strand on my professional website for a few years now, most recently a week or so ago. 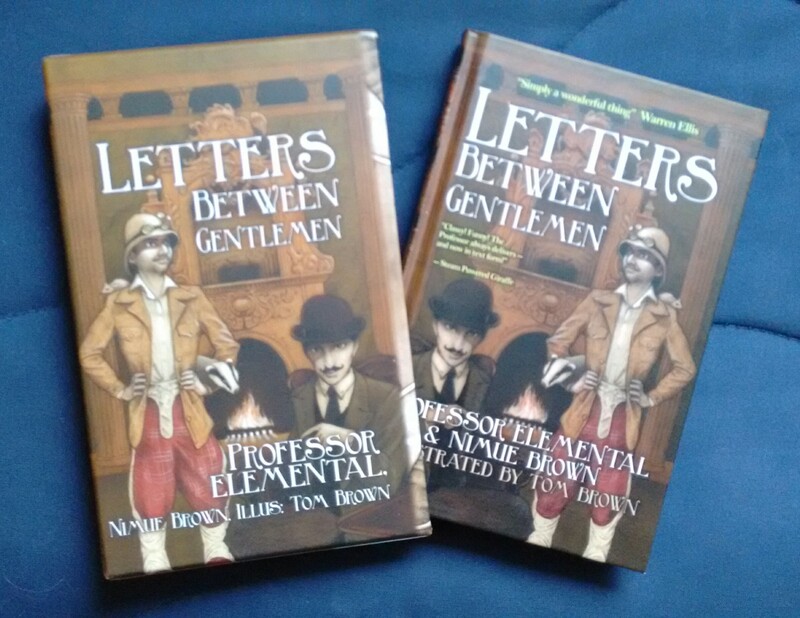 Having branched out into tea, t-shirts and comics, the sensible next move for the Professor Elemental brand would surely be a novel … and so it was to be. 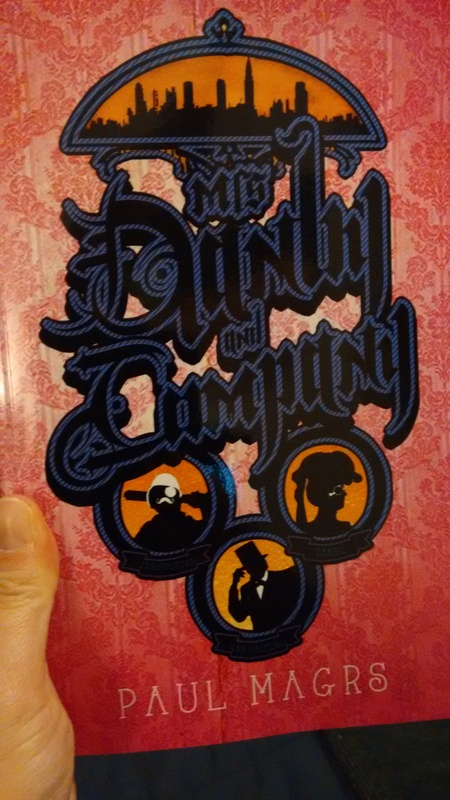 I was going to say that steampunk isn’t really my genre, but having read two books in the genre this month (the other being Paul Magrs’ “Mrs Danby and Company“, and yes, I have recommended the two Pauls to one another), I can’t really claim that any more. I would say that I don’t know the ins and outs of what a steampunk novel should be, but I gather from my small forays that it should feature a) wild and unpredictable inventions, b) said inventions being crafted from older materials such as brass and rivets rather than modern stuff, c) time settings in the Victorian/ Edwardian era, d) humour, e) memorable characters, f) a complex and highly amusing plot. If so, this one ticks all the boxes. With the main characters the private investigator Algernon Spoon, a batty aristo, Horatio Plunkett, and his very amenable sister Maude and Professor Elemental, here a real inventor with a besuited ape side-kick and an unfortunate habit of blowing up and otherwise accidentally destroying his inventions, their users and innocent bystanders, you know that mayhem is likely to ensue. Throw in some badgermingos, a huge metal Professor, some curiously veiled sisters, a tangle of dodgy societies and an even tighter tangle of a plot, and you’re guaranteed laughs and silliness. There’s satire, too, at gender and class relations and learned societies, which gives the book more depth and prevents it from being merely silly (there is a fair bit of innuendo which is not for the very easily offended). On the offence point, yes, there is murder most horrid and the odd disappearing puppy, but it’s done very lightly and nothing upset your feeble reviewer, so is not likely to upset you. The plot all comes together, there are some read-out-loud and laugh-out-loud moments, and the book itself is a very nice object – I was sent (thank you!) the hardback in a nice slip-case, and the book has a nice feel and some excellent illustrations. This book will suit: Fans of Professor Elemental; fans of Paul Magrs; fans of Terry Pratchett; general readers looking for an entertaining read. Disclaimer: I was sent this book for review by the Prof. I was not asked to link to the Professor Elemental website but have done so anyway. This book is subtitled “Allen Lane and the Penguin Editors” and is a history of Penguin books and particularly the series and imprints that it engendered, with particular regard to the editors who worked on these books and series. The editor himself uses material drawn from the Penguin archives to look at the work of these editors and their series, pulling together internal memoranda, letters between Penguin staff members and John Lane and correspondence between authors and editors. I particularly enjoyed the sections on Rieu, who edited the first Penguin Classics (which were all works in translation, even though we’re all used to those black-spined and red-topped editions of the Penguin Classics which featured Austen, Eliot, etc., aren’t we?) and Glover, who was taken on after he’d submitted lists of errors as a “mere” reader of Penguin books, and their passion for getting it right, and there were fascinating exchanges with the translators of the early Classics, as well as some on some inadvertently poisonous recipes in Alice B. Toklas’ cookery book (did you know she’d done one? I didn’t!). The book is very detailed, especially on political machinations within Penguin and the fine points of some series. It perhaps suffered a little from my having fairly recently read “Penguin Special” and “So Much to Tell” – I might be a bit Penguined-out now! But it was a good and valued addition to my collection, and a signed copy, too, which is nice. This book will suit readers interested in publishing, editing and Penguin; those with a robust ability to tolerate high levels of slightly dusty detail. The second volume of the Forsyte Saga, taking place 12 years after the events of “The Man of Property”. The man in question, Soames Forsyte, has a new property in Reading, while his cousin, Young Jolyon, continues to live at Robin Hill, with his three children and their unfortunately ageing dog (sensitive readers watch out for the inevitable here, although it is well-signposted and not gratuitous). Robin Hill is of course the house Soames had built to please his faithless / depressed and trapped (delete as applicable) wife Irene. Irene herself now lives in London, more comfortable on an income provided by Old Jolyon, who became fond of her in his later years. Now Soames has decided he wants to remarry (primarily to provide himself with an heir – a stark reminder of how different marriage arrangements are now, with said arrangements being made mainly with the young lady in question’s mother), and he must therefore consider the distasteful matter of divorce; this causes Young Jolyon, who looks after the administration of her legacy, to draw closer to Irene and try to protect her, especially as Soames becomes uncharacteristically (apart from where Irene is concerned) passionate about the whole affair and engages in some rather unfortunate encounters with her. Meanwhile, Soames’ sister faces marital woes and the courts as well, as her dodgy husband proves true to the impression he gives as he enters a mid-life crisis, and their father becomes increasingly frail and querulous. Young Jolyon’s son gets off to a bad start with his second cousin, Soames’ nephew; although both are at Oxford, they revolve in very different circles and find themselves on the opposite sides of both political and personal disputes, showing the Forsytes’ propensity for feuds and fallings-out moving down to the next generation. The Boer War also starts to encroach on the safe and somewhat smug world of the Forsytes. My previous reviews from 2007 (This does also include a review of “To Let”, the final book in this trilogy, so might contain spoilers). Bridget’s review, Ali’s review and Karen’s to come. This book will suit people who’ve read the first novel – these aren’t really standalone books but as a series are most satisfying. I’m currently reading a wonderful biography of Harold Nicolson by James Lees-Milne which is very entertaining and beautifully written. Once I’ve got a little distance from the Forsytes, it’ll be Trollope time! What are you reading at the moment? I’ve left the January TBR up for these reviews of books read in that month, and so as not to scare the easily shocked among you with a re-post of the frightening February TBR … Anyway, at LAST I review “The Ragged Trousered Philanthropists”, alongside another interesting book which also discusses poverty, social injustice and social mobility. All sounding a bit dry? Well, one of these books was far more entertaining than the other, in my view, and it’s not the way around that you’d probably expect! When I picked this up from the BookCrossing stall at the Moseley Festival back in the summer, I was excited to find a Monica Dickens I hadn’t heard of before. I loved her autobiographical works (“One Pair of Hands”, etc.) but I do forget that her novels tend towards the grimmer end of the spectrum, and this is no exception. It pretty much opens with a fire at an orphanage that leaves one baby injured and one baby dead (but which one? – this is an important plot point, but it is still grim and a bit unexpected) and proceeds by way of poverty, genteel and otherwise, family discord, snobbery and reverse snobbery, gangs of unruly children, marital disharmony, the effects on families of having too many children, confused identities, a cat coming to an unpleasant end (watch out, fellow “don’t put animals in books just to kill them” readers) and squalid living places. The central character – will we ever know whether she’s Joy or Josephine? – is ambitious but not particularly likeable, although she does have any pleasantness squashed out of her by her living situation growing up, which I think is the point, and there aren’t really any sympathetic characters in the book, which isn’t something that normally bothers me too much, but did make for a somewhat dreary read. The discussions, both implicit in the plot and explicit in the characters’ interactions, on nature versus nurture and people’s ability to transcend their genes and/or childhoods are interesting, although a little dated at times. The ending is reasonably satisfying if not conclusive (which is also fine) and lingers in the mind as a reminder of this rather strange book. I have wanted to read this book for a long time, and I’m quite surprised that I hadn’t done so many years ago, having a penchant for the left-leaning type of politics and being interested in social history. Anyway, when I discovered that it was published in 1914 (although I think not in this unexpurgated form), which was a very poor year for book publishing but the first in my Reading a Century of Books project, I determined to pick up a copy as soon as I saw one (but not go out to seek one – them’s the rules). It wasn’t long before I spotted the nice new paperback edition in a lovely bookshop (which has unfortunately now packed up and moved to Littlehampton) and so it was that a socialist epic novel became the first literary purchase of my married life. On to the book. I started off a bit confused, I must admit. I had got it into my head (how?) that the poor beleaguered workmen whose lives we follow over a couple of years form some kind of philanthropic society to help their fellow men. In fact, of course, that never happens, and their philanthropy actually lies in their giving their best years, strength and health to their masters and the capitalist system. But it didn’t disappoint me once I’d realised that. It’s an uneven but powerful book. I understand that most editions have been cut, with this being the first (?) full one. I’m not sure what they would have cut, as the didactic sections, exemplars and speeches are woven together to make a whole. Characters do come and go in and out of focus (and a kitten is introduced which had me worried (see review above) but actually simply ceased to be mentioned part way through, which was a bit odd – I mention that to help anyone else who’s worried, as I couldn’t find anything on it except a note that it’s a Metaphor (well, yes)), and obviously events and set pieces are very much shaped to the purpose of the author. The interspersed scenes from the life of the corrupt Town Council were both reminiscent of that other great novel of town life, “South Riding” and horribly scathing and savage indictments of the people who seek to “run” their fellow citizens’ lives. The detailed descriptions of work and family life should be required reading for those who seek to dismantle the National Health Service and the Welfare State as well as deregulating laws on working practices (the workers in this book have the original zero hours contracts), and for those who seek to maintain or reform the system. It was pretty horrific to read of soup kitchens and people pawning their good clothes to find money for food, and know that over 100 years later, this sort of situation is on the rise again in this country. There’s also a passage about the use (or not) of reasoning with people with fixed ideas and disordered minds which brings to mind the exhortation not to try to change the opinion of a stranger on the Internet – nothing changes, does it! Although there are some grim scenes as well as set pieces and discussions which are didactic in purpose and nature, I didn’t find it a dry read, and there’s a humanity and care for his fellow humans on the part of the author and some of his characters that kept me reading, even though I will admit that the writing became a little turgid at times. The descriptions of socialist utopias were of course written before the great Communist experiments of the 20th century got underway, so read as a little over-idealistic at times, but still with good points to make, and so I forgive the occasional unevenness of the writing and plot. I know a few people were planning to read this alongside me this year, so I hope you are able to comment with a link to your review, either now or when you’ve finished it, or let me know that you’re still planning to read it and will comment when you have. I’d love to hear what everyone else thought of it, as there has been a variety of responses among friends on social media already! I for one am glad I have finally read it. I couldn’t resist picking up a copy of Paul Magrs’ new book (even though I still yearn for the days of those early books set on estates in the North East with just a sprinkling of magic and a lot of realism); after 20 years in the business, he certainly knows what he’s doing, and he’s got a charming style that’s hard to pin down, but I’d recognise one of his paragraphs anywhere. This is a new adventure, featuring a famous detective’s ex-housekeeper, a distinguished vampire hunter and a famed explorer and scientist who encounter one another on a strangely doomed-feeling Atlantic crossing. Undersea and other-worldly adventures ensue, with characters from the Brenda and Effie novels (including some rather sinister furniture) making the odd appearance and providing a nice little moment for long-term fans of the author, while not confusing the new reader. The triple narrative, which has nicely distinguished voices (not something that you can guarantee these days) undermines the narrators, gives the whole story and provides for some giggles. I would recommend this to people who like their magical adventures with a side order of common-sense – where else would you find a consideration of how to get the remains of recently deceased vampires off your Good Coat? Plenty of twists and turns and there are enough unresolved details to make the way clear for a sequel – hooray! This book will suit: people who like steampunk with a smile; Paul Magrs fans; people who like a good jolly adventure and a bit of a giggle. No disclaimer needed: Although I have had tea with the author, I bought this book myself from Amazon. If you fancy reading it, you can find it here! An Alfred Hitchcock and the Three Investigators book (Book 6 in the series) – this one still has Alfred Hitchcock involved at the beginning and end, which later numbers dropped. In a departure from the usual story, Jupiter Jones, head detective, is confined to barracks with a cold, while Pete and Bob are the ones who are put into danger as they try to work out just who is trying to put a film company off using an old theme park on an island – and why. Strangers are mistrusted and a community obsessed with treasure closes ranks – who can and cannot be trusted? Oh, the horror, the horror! It’s always bad in February, the TBR – after all, there’s Christmas, and then my Birthday, and those do tend to attract the booky kind of gift. Which is GREAT, of course, if a little terrifying. I have had a Month of Re-Reading in January in the past but have eschewed that this year … and I don’t think it’s going to happen in February now, either (see Failures, below). In positive news, I did finish eleven books in January (three reviews still to post), which is a better total than I have been getting, but the TBR is looking a little, well, full at the moment. I’m currently reading a book about Penguin Books and its editors. It’s a little slow, partly because I’ve recently read a history of Penguin and Allen Lane and one about Puffin Books, and partly because it’s made up of a lot of quotations, but the main text is in small print and the quotations in larger print, which keeps confusing me! Coming up, I have the next volume in The Forsyte Saga, which I’m very much looking forward to, and then I WILL start on Anthony Trollope’s Barsetshire Novels (see Failures, below). I also have this variety of fiction and non-fiction – political diaries, psychogeography, the Vikings, a novel I know nothing about, a memoir about being and not being a nun, a Virago and a book about books. There’s a nice variety there, anyway. 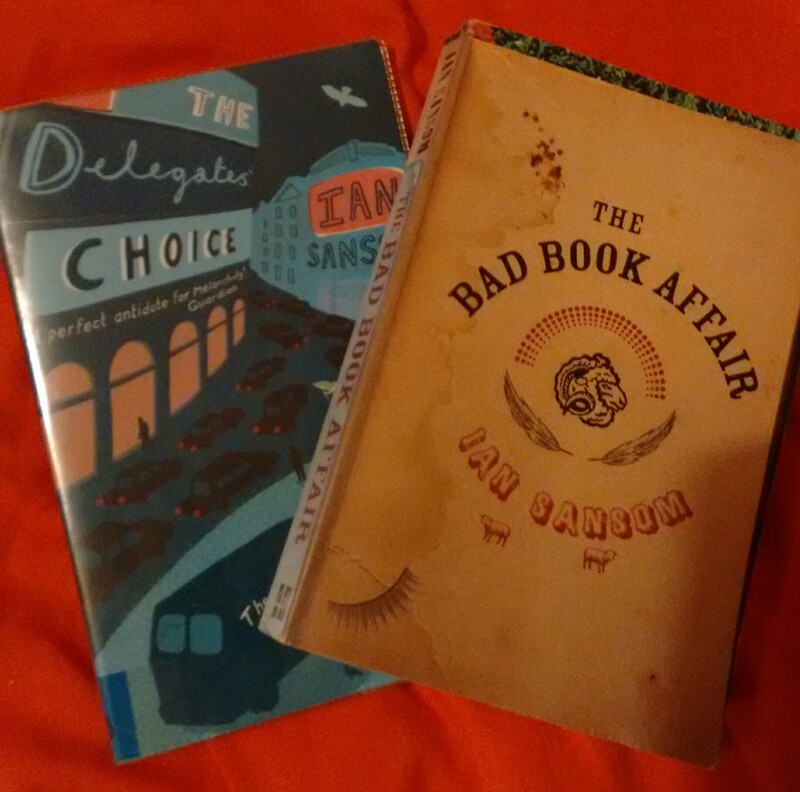 I also have a Book Confession, in the form of two Ian Sansom books in the Mobile Library mysteries series – Gill kindly offered to pass them to me so here they are, although she assures me that she doesn’t need them back, I can BookCross them when I’ve finished with them, and there’s no rush to do that, so they’ve popped onto the end of that bursting shelf above. I have also acquired a new book about Iris Murdoch, which I will photograph in due course. It’s one of those Hard Books with all philosophy in, so I’ll be gentle with myself when I get to it. I have failed to get a Month of Re-Reading in yet, even though I love doing it. I have too many lovely new books, and I’m letting them get out of hand. Some of these have to be read before I re-read. I have failed to start Anthony Trollope yet! I must do that this month. I am SO looking forward to reading him, so I’m going to make a big effort not to let him get shoved aside again. I completely failed to read any WW1 stuff last year apart from Rupert Brooke’s poems. 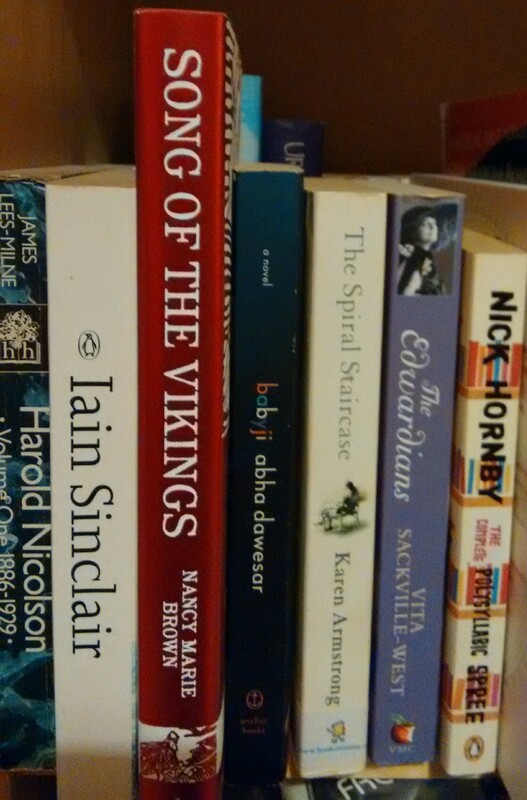 I had a book of general WW1 poems on the TBR shelf ALL YEAR last year, and now it’s being shelved again. Oops. I bought that lovely book of Icelandic saga translations (horizontal on the TBR pic) and set up a Facebook group to discuss sagas: have I opened it more than once? I have not. I must make time for some of these before our wedding anniversary in April. In successes, well, I did read those 11 in January and if I’ve managed to make room to READ and comment on blogs that I follow, so I’m pretty up to date now, I can definitely make more room for BOOK READING, too. I’ve also got to half-way in my Reading a Century project, counting books read and on the TBR, so that’s quite exciting. Any suggestions for filling in the 60s and 70s gratefully received! And, one review I didn’t post because it was destined for elsewhere has now been published in the Shiny New Books e-magazine, new edition available now. This is “Merchant Adventurers” by James Evans, which was a very good read – why not pop over and read my slightly-longer-than-the-ones-on-this-blog review, here. Thanks to the Shiny New Book people for thinking of me when the non-fiction was up for grabs! So I’m not going to moan and maunder and dwell – I’m going to read and enjoy my books, make more time to do so, and not fret if I don’t do what I plan to do, as long as I’m reading! How are your booky 2015s going so far? Do you have a TBR glut, too?